The Accidental Prime Minister Box Office Prediction; Hit or Flop? The Accidental PM; HIT or FLOP? 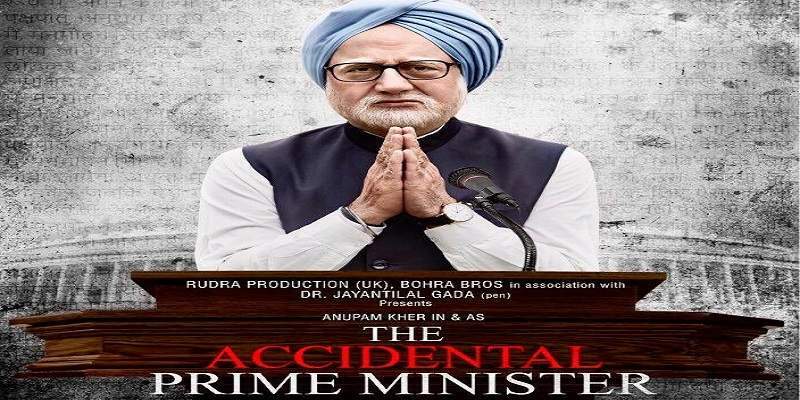 'The Accidental Prime Minister' is a political drama film, that is reportedly based on the book 'The Accidental Prime Minister' written by Sanjaya Baru, who was the media advisor of the then PM of India, Dr. Manmohan Singh. The movie is directed by Sanjay Rattnakar Gutte; and veteran actor Anupam Kher is playing the role of former PM Manmohan Singh. The film is releasing on 11th January 2019. 'The Accidental Prime Minister' ran into a controversy when the film's trailer was released. The film gained a lot of publicity due the controversy, and also gained a lot of momentum on the social media because of its political theme. The mainstream TV news media also gave the film a good publicity by giving the topic a good airtime in form of debates and interviews. Here in this article, we will give you a thorough box office analysis of the film, and its final outcome at the box office. So, read on. The trailer generated a good amount of buzz and garnered a lot of views on Youtube, within a few hours of its release. The trailer currently has over 60 million views. But, views on Youtube cannot be translated into box office success. The recent movie 'Zero' which had over 100 million views at the time of its release, is an example of that fact. The views just mean that the people are curious about the film. But will they spend their money to watch the film in the theatres? Let's analyse. The movie is releasing two weeks after a major Bollywood release. The film 'URI The Surgical Strike' is also releasing on the same day. Big star films like Rajinikanth's 'Petta', and Ajith Kumar's 'Viswasam' are being released in Tamilnadu. Balakrishna & Vidya Balan starrer 'NTR Kathanayakudu', and Ram Charan & Kiara Advani starrer 'Vinaya Vidheya Rama' are releasing in Andhra Pradesh and Telangana. So, getting screens in southern India is going to be a tough task for 'The Accidental Prime Minister'. And 'Simmba' is still going strong at the box office churning out good numbers day after day. It's a tough competition at the box office this week. But unlike 'The Accidental Prime Minister', the other movies have a 'star' actor as their lead, which can guarantee at least a decent opening. The film's lead actor Anupam Kher, has largely played supporting roles throughout his career, and lacks the 'star-power' that could give the film a good opening. The box office prospects of 'The Accidental Prime Minister' will solely be dependent on the film's content quality and the audience word-of-mouth. Also, the subject of the movie is unappealing for the 'mass' audience to spend their money to watch it on the big screen. The film is essentially a multiplex movie, and will only be appealing to a very small section of the moviegoers. The film's genre and content narrows down its target audience to a very niche market. It excludes people who are non-political, the below 18 young audience, and the mass single screen audience. Since the movie is based on real life characters, the characters being famous and well known, and so much has been said and written about them, there is nothing unknown or new about the film. The story lacks the novelty that could make people to watch this film in the cinemas. Even for people who are ardent followers of politics, the movie is less interesting, as they already know what the movie wants to tell them, and there is nothing new on offer. The masala-action and comedy genre have been the most successful at the box office, and 'The Accidental Prime Minister' belongs to the genre that has been the least successful at the Bollywood box office. Political films have always struggled at the Indian box office. It is hard to imagine 'The Accidental Prime Minister' getting good numbers at the box office. The 2017 political film, 'Indu Sarkar', directed by Madhur Bhandarkar, also revolved around the Gandhis', was also entangled in controversies, got good airtime in the news media in form of debates, interviews and news bulletins. But finally tanked at the box office, failing recover even half of its production budget. Anupam Kher featured in this movie in a supporting role. And in 2016, the political drama film, 'Buddha In A Traffic Jam', directed by Vivek Agnihotri, also flopped at the box office. Anupam Kher was in this film as well, in a supporting role. While political films have largely failed at the box office, the films with patriotic themes have a good track record at the box office, specially in the last decade. This is the reason why 'Uri The Surgical Strike' could emerge as the best performing film this weekend. 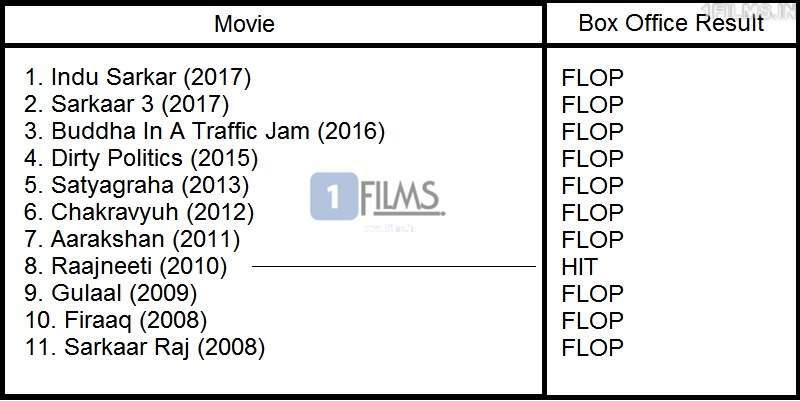 Below is a table of Bollywood political films that released in the last ten years, and their fate at the box office. The 2005 political film 'Sarkaar' starring Amitabh Bachchan and Abhishek Bachchan, was a HIT at the box office. The political films which were successful at the box office, are all fictional stories with action, songs and masala. They have an entertainment quotient in them. Also, those movies had star actors playing the lead roles. But, even then, the success rate is quite low. Films like Chakravyuh, Aarakshan and Satyagraha flopped at the box office despite having a multi-star cast. Even though the team of 'The Accidental Prime Minister' is doing good promotions of the film on social media, tv, internet and radio; they don't have enough promotion material in their hands apart from the controversial trailer, like songs, dance numbers and action sequences. The Accidental Prime Minister, will have a hard time availing screens. Single screens will automatically be out of its kitty. Even at the multiplexes, the film will have a hard time because of the kind of film it is. 'URI The Surgical Strike' being a patriotical action film, the genre which has enjoyed great success at the box office of late, will bag the most number of screens on Jan 11. 'The Accidental Prime Minister' might be released in around 500 to 600 screens all across India. We estimate the production cost of 'The Accidental Prime Minister' to be around of 10 - 12 crores. Enough with all the talks. Let's get down to the numbers. The film will have a low opening at the box office. And the movie will almost end its box office run at the end of first week. The movie will be a flop at the box office. Unless the movie turns out be amazingly extraordinary, and enjoys unprecedented positive word-of-mouth, causing sudden hordes of people hitting the theatres to watch, this film will meet the same fate that 'Indu Sarkar' and other similar films met.